"BCD code" redirects here. For BCD character sets, see BCD (character encoding). In computing and electronic systems, binary-coded decimal (BCD) is a class of binary encodings of decimal numbers where each decimal digit is represented by a fixed number of bits, usually four or eight. Special bit patterns are sometimes used for a sign or for other indications (e.g., error or overflow). BCD's main virtue is its more accurate representation and rounding of decimal quantities as well as an ease of conversion into human-readable representations, in comparison to binary positional systems. BCD's principal drawbacks are a small increase in the complexity of the circuits needed to implement basic arithmetics and a slightly less dense storage. BCD takes advantage of the fact that any one decimal numeral can be represented by a four bit pattern. The most obvious way of encoding digits is "natural BCD" (NBCD), where each decimal digit is represented by its corresponding four-bit binary value, as shown in the following table. This is also called "8421" encoding. Other encodings are also used, including so-called "4221" and "7421"—named after the weighting used for the bits—and "Excess-3". For example, the BCD digit 6, '0110'b in 8421 notation, is '1100'b in 4221 (two encodings are possible), '0110'b in 7421, and '1001'b (6+3=9) in excess-3. Unpacked: Each number is encoded into one byte, with four bits representing the number and the remaining bits having no significance. 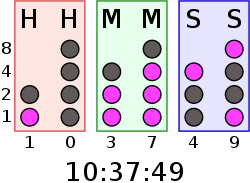 Packed: Two number are encoded into a single byte, with one number in the least significant nibble (bits 0 through 3) and the other numeral in the most significant nibble (bits 4 through 7). Hence the numerical range for one unpacked BCD byte is zero through nine inclusive, whereas the range for one packed BCD is zero through ninety-nine inclusive. Here, the most significant nibble of the most significant byte has been encoded as zero, so the number is stored as 012345 (but formatting routines might replace or remove leading zeros). Packed BCD is more efficient in storage usage than unpacked BCD; encoding the same number (with the leading zero) in unpacked format would consume twice the storage. Shifting and masking operations are used to pack or unpack a packed BCD digit. Other bitwise operations are used to convert a numeral to its equivalent bit pattern or reverse the process. BCD is very common in electronic systems where a numeric value is to be displayed, especially in systems consisting solely of digital logic, and not containing a microprocessor. By employing BCD, the manipulation of numerical data for display can be greatly simplified by treating each digit as a separate single sub-circuit. This matches much more closely the physical reality of display hardware—a designer might choose to use a series of separate identical seven-segment displays to build a metering circuit, for example. If the numeric quantity were stored and manipulated as pure binary, interfacing to such a display would require complex circuitry. Therefore, in cases where the calculations are relatively simple, working throughout with BCD can lead to a simpler overall system than converting to and from binary. Most pocket calculators do all their calculations in BCD. In packed BCD (or simply packed decimal), each of the two nibbles of each byte represent a decimal digit. Packed BCD has been in use since at least the 1960s and is implemented in all IBM mainframe hardware since then. Most implementations are big endian, i.e. with the more significant digit in the upper half of each byte, and with the leftmost byte (residing at the lowest memory address) containing the most significant digits of the packed decimal value. The lower nibble of the rightmost byte is usually used as the sign flag, although some unsigned representations lack a sign flag. As an example, a 4-byte value consists of 8 nibbles, wherein the upper 7 nibbles store the digits of a 7-digit decimal value and the lowest nibble indicates the sign of the decimal integer value. Standard sign values are 1100 (hex C) for positive (+) and 1101 (D) for negative (−). This convention comes from the zone field for EBCDIC characters and the signed overpunch representation. Other allowed signs are 1010 (A) and 1110 (E) for positive and 1011 (B) for negative. IBM System/360 processors will use the 1010 (A) and 1011 (B) signs if the A bit is set in the PSW, for the ASCII-8 standard that never passed. Most implementations also provide unsigned BCD values with a sign nibble of 1111 (F). ILE RPG uses 1111 (F) for positive and 1101 (D) for negative. These match the EBCDIC zone for digits without a sign overpunch. In packed BCD, the number 127 is represented by 0001 0010 0111 1100 (127C) and −127 is represented by 0001 0010 0111 1101 (127D). Burroughs systems used 1101 (D) for negative, and any other value is considered a positive sign value (the processors will normalize a positive sign to 1100 (C)). No matter how many bytes wide a word is, there are always an even number of nibbles because each byte has two of them. Therefore, a word of n bytes can contain up to (2n)−1 decimal digits, which is always an odd number of digits. A decimal number with d digits requires 1/2(d+1) bytes of storage space. Like character strings, the first byte of the packed decimal – that with the most significant two digits – is usually stored in the lowest address in memory, independent of the endianness of the machine. In contrast, a 4-byte binary two's complement integer can represent values from −2,147,483,648 to +2,147,483,647. While packed BCD does not make optimal use of storage (about one-sixth of the memory used is wasted), conversion to ASCII, EBCDIC, or the various encodings of Unicode is still trivial, as no arithmetic operations are required. The extra storage requirements are usually offset by the need for the accuracy and compatibility with calculator or hand calculation that fixed-point decimal arithmetic provides. Denser packings of BCD exist which avoid the storage penalty and also need no arithmetic operations for common conversions. Packed BCD is supported in the COBOL programming language as the "COMPUTATIONAL-3" (an IBM extension adopted by many other compiler vendors) or "PACKED-DECIMAL" (part of the 1985 COBOL standard) data type. It is supported in PL/I as "FIXED DECIMAL". Besides the IBM System/360 and later compatible mainframes, packed BCD is implemented in the native instruction set of the original VAX processors from Digital Equipment Corporation and some models of the SDS Sigma series mainframes, and is the native format for the Burroughs Corporation Medium Systems line of mainframes (descended from the 1950s Electrodata 200 series). The decimal point is not actually stored in memory, as the packed BCD storage format does not provide for it. Its location is simply known to the compiler and the generated code acts accordingly for the various arithmetic operations. If a decimal digit requires four bits, then three decimal digits require 12 bits. However, since 210 (1,024) is greater than 103 (1,000), if three decimal digits are encoded together, only 10 bits are needed. Two such encodings are Chen–Ho encoding and densely packed decimal (DPD). The latter has the advantage that subsets of the encoding encode two digits in the optimal seven bits and one digit in four bits, as in regular BCD. Some implementations, for example IBM mainframe systems, support zoned decimal numeric representations. Each decimal digit is stored in one byte, with the lower four bits encoding the digit in BCD form. The upper four bits, called the "zone" bits, are usually set to a fixed value so that the byte holds a character value corresponding to the digit. EBCDIC systems use a zone value of 1111 (hex F); this yields bytes in the range F0 to F9 (hex), which are the EBCDIC codes for the characters "0" through "9". Similarly, ASCII systems use a zone value of 0011 (hex 3), giving character codes 30 to 39 (hex). (*) Note: These characters vary depending on the local character code page setting. IBM used the terms Binary-Coded Decimal Interchange Code (BCDIC, sometimes just called BCD), for 6-bit alphanumeric codes that represented numbers, upper-case letters and special characters. Some variation of BCDIC alphamerics is used in most early IBM computers, including the IBM 1620, IBM 1400 series, and non-Decimal Architecture members of the IBM 700/7000 series. The IBM 1400 series are character-addressable machines, each location being six bits labeled B, A, 8, 4, 2 and 1, plus an odd parity check bit (C) and a word mark bit (M). For encoding digits 1 through 9, B and A are zero and the digit value represented by standard 4-bit BCD in bits 8 through 1. For most other characters bits B and A are derived simply from the "12", "11", and "0" "zone punches" in the punched card character code, and bits 8 through 1 from the 1 through 9 punches. A "12 zone" punch set both B and A, an "11 zone" set B, and a "0 zone" (a 0 punch combined with any others) set A. Thus the letter A, which is (12,1) in the punched card format, is encoded (B,A,1). The currency symbol $, (11,8,3) in the punched card, was encoded in memory as (B,8,2,1). This allows the circuitry to convert between the punched card format and the internal storage format to be very simple with only a few special cases. One important special case is digit 0, represented by a lone 0 punch in the card, and (8,2) in core memory. The memory of the IBM 1620 is organized into 6-bit addressable digits, the usual 8, 4, 2, 1 plus F, used as a flag bit and C, an odd parity check bit. BCD alphamerics are encoded using digit pairs, with the "zone" in the even-addressed digit and the "digit" in the odd-addressed digit, the "zone" being related to the 12, 11, and 0 "zone punches" as in the 1400 series. Input/Output translation hardware converted between the internal digit pairs and the external standard 6-bit BCD codes. In the Decimal Architecture IBM 7070, IBM 7072, and IBM 7074 alphamerics are encoded using digit pairs (using two-out-of-five code in the digits, not BCD) of the 10-digit word, with the "zone" in the left digit and the "digit" in the right digit. Input/Output translation hardware converted between the internal digit pairs and the external standard 6-bit BCD codes. With the introduction of System/360, IBM expanded 6-bit BCD alphamerics to 8-bit EBCDIC, allowing the addition of many more characters (e.g., lowercase letters). A variable length Packed BCD numeric data type is also implemented, providing machine instructions that perform arithmetic directly on packed decimal data. On the IBM 1130 and 1800, packed BCD is supported in software by IBM's Commercial Subroutine Package. Today, BCD data is still heavily used in IBM processors and databases, such as IBM DB2, mainframes, and Power6. In these products, the BCD is usually zoned BCD (as in EBCDIC or ASCII), Packed BCD (two decimal digits per byte), or "pure" BCD encoding (one decimal digit stored as BCD in the low four bits of each byte). All of these are used within hardware registers and processing units, and in software. To convert packed decimals in EBCDIC table unloads to readable numbers, you can use the OUTREC FIELDS mask of the JCL utility DFSORT. The Digital Equipment Corporation VAX-11 series includes instructions that can perform arithmetic directly on packed BCD data and convert between packed BCD data and other integer representations. The VAX's packed BCD format is compatible with that on IBM System/360 and IBM's later compatible processors. The MicroVAX and later VAX implementations dropped this ability from the CPU but retained code compatibility with earlier machines by implementing the missing instructions in an operating system-supplied software library. This is invoked automatically via exception handling when the no longer implemented instructions are encountered, so that programs using them can execute without modification on the newer machines. The Intel x86 architecture supports a unique 18-digit (ten-byte) BCD format that can be loaded into and stored from the floating point registers, and computations can be performed there. The Motorola 68000 series had BCD instructions. The two nibbles of the result, 0001 and 0111, correspond to the digits "1" and "7". This yields "17" in BCD, which is the correct result. This technique can be extended to adding multiple digits by adding in groups from right to left, propagating the second digit as a carry, always comparing the 5-bit result of each digit-pair sum to 9. Some CPUs provide a half-carry flag to facilitate BCD arithmetic adjustments following binary addition and subtraction operations. Subtraction is done by adding the ten's complement of the subtrahend. To represent the sign of a number in BCD, the number 0000 is used to represent a positive number, and 1001 is used to represent a negative number. The remaining 14 combinations are invalid signs. To illustrate signed BCD subtraction, consider the following problem: 357 − 432. In signed BCD, 357 is 0000 0011 0101 0111. The ten's complement of 432 can be obtained by taking the nine's complement of 432, and then adding one. So, 999 − 432 = 567, and 567 + 1 = 568. By preceding 568 in BCD by the negative sign code, the number −432 can be represented. So, −432 in signed BCD is 1001 0101 0110 1000. Thus the result of the subtraction is 1001 1001 0010 0101 (−925). To confirm the result, note that the first digit is 9, which means negative. This seems to be correct, since 357 − 432 should result in a negative number. The remaining nibbles are BCD, so 1001 0010 0101 is 925. The ten's complement of 925 is 1000 − 925 = 75, so the calculated answer is −75. If there are a different number of nibbles being added together (such as 1053 − 2), the number with the fewer digits must first be prefixed with zeros before taking the ten's complement or subtracting. So, with 1053 − 2, 2 would have to first be represented as 0002 in BCD, and the ten's complement of 0002 would have to be calculated. The binary-coded decimal scheme described in this article is the most common encoding, but there are many others. The method here can be referred to as Simple Binary-Coded Decimal (SBCD) or BCD 8421. The following table represents decimal digits from 0 to 9 in various BCD systems. In the headers to the table, the '8 4 2 1', indicates the weight of each bit shown; in the fifth column, "BCD 8 4 −2 −1", two of the weights are negative. Both ASCII and EBCDIC character codes for the digits are examples of zoned BCD, and are also shown in the table. In the 1972 case Gottschalk v. Benson, the U.S. Supreme Court overturned a lower court decision which had allowed a patent for converting BCD encoded numbers to binary on a computer. This was an important case in determining the patentability of software and algorithms. Many non-integral values, such as decimal 0.2, have an infinite place-value representation in binary (.001100110011...) but have a finite place-value in binary-coded decimal (0.0010). Consequently, a system based on binary-coded decimal representations of decimal fractions avoids errors representing and calculating such values. This is useful in financial calculations. Scaling by a power of 10 is simple. Rounding at a decimal digit boundary is simpler. Addition and subtraction in decimal does not require rounding. Alignment of two decimal numbers (for example 1.3 + 27.08) is a simple, exact, shift. Conversion to a character form or for display (e.g., to a text-based format such as XML, or to drive signals for a seven-segment display) is a simple per-digit mapping, and can be done in linear (O(n)) time. Conversion from pure binary involves relatively complex logic that spans digits, and for large numbers no linear-time conversion algorithm is known (see Binary numeral system § Conversion to and from other numeral systems). Standard BCD requires four bits per digit, roughly 20 percent more space than a binary encoding (the ratio of 4 bits to log210 bits is 1.204). When packed so that three digits are encoded in ten bits, the storage overhead is greatly reduced, at the expense of an encoding that is unaligned with the 8-bit byte boundaries common on existing hardware, resulting in slower implementations on these systems. Practical existing implementations of BCD are typically slower than operations on binary representations, especially on embedded systems, due to limited processor support for native BCD operations. The BIOS in many personal computers stores the date and time in BCD because the MC6818 real-time clock chip used in the original IBM PC AT motherboard provided the time encoded in BCD. This form is easily converted into ASCII for display. The Atari 8-bit family of computers used BCD to implement floating-point algorithms. The MOS 6502 processor has a BCD mode that affects the addition and subtraction instructions. The Psion Organiser 1 handheld computer’s manufacturer-supplied software also used entirely BCD to implement floating point; later Psion models used binary exclusively. Early models of the PlayStation 3 store the date and time in BCD. This led to a worldwide outage of the console on 1 March 2010. The last two digits of the year stored as BCD were misinterpreted as 16 causing an error in the unit's date, rendering most functions inoperable. This has been referred to as the Year 2010 Problem. Various BCD implementations exist that employ other representations for numbers. Programmable calculators manufactured by Texas Instruments, Hewlett-Packard, and others typically employ a floating-point BCD format, typically with two or three digits for the (decimal) exponent. The extra bits of the sign digit may be used to indicate special numeric values, such as infinity, underflow/overflow, and error (a blinking display). 3GPP developed TBCD, an expansion to BCD where the remaining (unused) bit combinations are used to add specific telephony characters, with digits similar to those found in telephone keypads original design. The mentioned 3GPP document defines TBCD-STRING with swapped nibbles in each byte. Bits, octets and digits indexed from 1, bits from the right, digits and octets from the left. Meaning number 1234, would become 21 43 in TBCD. If errors in representation and computation are more important than the speed of conversion to and from display, a scaled binary representation may be used, which stores a decimal number as a binary-encoded integer and a binary-encoded signed decimal exponent. For example, 0.2 can be represented as 2×10−1. This representation allows rapid multiplication and division, but may require shifting by a power of 10 during addition and subtraction to align the decimal points. It is appropriate for applications with a fixed number of decimal places that do not then require this adjustment—particularly financial applications where 2 or 4 digits after the decimal point are usually enough. Indeed, this is almost a form of fixed point arithmetic since the position of the radix point is implied. Chen–Ho encoding provides a boolean transformation for converting groups of three BCD-encoded digits to and from 10-bit values that can be efficiently encoded in hardware with only 2 or 3 gate delays. Densely packed decimal (DPD) is a similar scheme that is used for most of the significand, except the lead digit, for one of the two alternative decimal encodings specified in the IEEE 754-2008 standard. ^ That is, in a standard packed 4-bit representation, there are 16 states (four bits for each digit) with 10 tetrades and 6 pseudo-tetrades, whereas in more densely packed schemes such as Chen–Ho or DPD coding there are less, f.e. only 24 pseudo-tetrades in 1024 states (10 bits for three digits). ^ Intel. "ia32 architecture manual" (PDF). Intel. Retrieved 2015-07-01. ^ Schneider, Hans-Jochen (1986). Lexikon der Informatik und Datenverarbeitung (in German) (2 ed.). R. Oldenbourg Verlag München Wien. ISBN 3-486-22662-2. ^ Tafel, Hans Jörg (1971). Written at RWTH, Aachen, Germany. Einführung in die digitale Datenverarbeitung [Introduction to digital information processing] (in German). Munich, Germany: Carl Hanser Verlag. ISBN 3-446-10569-7. ^ Steinbuch, Karl W.; Weber, Wolfgang; Heinemann, Traute, eds. (1974) . Taschenbuch der Informatik - Band II - Struktur und Programmierung von EDV-Systemen. Taschenbuch der Nachrichtenverarbeitung (in German). 2 (3 ed.). Berlin, Germany: Springer-Verlag. ISBN 3-540-06241-6. LCCN 73-80607. ^ Tietze, Ulrich; Schenk, Christoph (2012-12-06). Advanced Electronic Circuits. Springer Science & Business Media. ISBN 3642812414. 9783642812415. Retrieved 2015-08-05. ^ Kowalski, Emil (2013-03-08) . Nuclear Electronics. Springer-Verlag. doi:10.1007/978-3-642-87663-9. ISBN 3642876633. 9783642876639, 978-3-642-87664-6. Retrieved 2015-08-05. ^ Ferretti, Vittorio (2013-03-13). Wörterbuch der Elektronik, Datentechnik und Telekommunikation / Dictionary of Electronics, Computing and Telecommunications: Teil 1: Deutsch-Englisch / Part 1: German-English. 1 (2 ed.). Springer-Verlag. ISBN 3642980880. 9783642980886. Retrieved 2015-08-05. ^ Speiser, Ambrosius Paul (1965) . Digitale Rechenanlagen - Grundlagen / Schaltungstechnik / Arbeitsweise / Betriebssicherheit [Digital computers - Basics / Circuits / Operation / Reliability] (in German) (2 ed.). ETH Zürich, Zürich, Switzerland: Springer-Verlag / IBM. p. 209. LCCN 65-14624. 0978. ^ Cowlishaw, Mike F. (2015) [1981,2008]. "General Decimal Arithmetic". Retrieved 2016-01-02. ^ Parag K., Lala (2007). Principles of Modern Digital Design. John Wiley & Sons. pp. 20–25. ISBN 978-0-470-07296-7. ^ University of Alicante. "A Cordic-based Architecture for High Performance Decimal Calculations" (PDF). IEEE. Retrieved 2015-08-15. ^ Intel® 64 and IA-32 Architectures Software Developer’s Manual, Volume 1: Basic Architecture. Intel Corporation. December 2016. pp. 4–9. ^ Jones, Douglas W. (2015-11-25) . "BCD Arithmetic, a tutorial". Arithmetic Tutorials. Iowa City, Iowa, USA: The University of Iowa, Department of Computer Science. Retrieved 2016-01-03. ^ 3GPP TS 29.002: Mobile Application Part (MAP) specification (Technical report). 2013. sec. 17.7.8 Common data types. ^ "Signalling Protocols and Switching (SPS) Guidelines for using Abstract Syntax Notation One (ASN.1) in telecommunication application protocols" (PDF). p. 15. ^ "XOM Mobile Application Part (XMAP) Specification" (PDF). p. 93. Richards, Richard Kohler (1955). Arithmetic Operations in Digital Computers. New York, USA: van Nostrand. pp. 397-. Reversible Implementation of Densely-Packed-Decimal Converter to and from Binary-Coded-Decimal Format Using in IEEE-754R, A. Kaivani, A. Zaker Alhosseini, S. Gorgin, and M. Fazlali, 9th International Conference on Information Technology (ICIT'06), pp273–276, IEEE, December 2006. Cowlishaw, Mike F. (2009) [2002,2008]. "Bibliography of material on Decimal Arithmetic – by category". General Decimal Arithmetic. IBM. Retrieved 2016-01-02. Cowlishaw, Mike F. (2014) . "A Summary of Chen-Ho Decimal Data encoding". General Decimal Arithmetic. IBM. Retrieved 2016-01-02. Cowlishaw, Mike F. (2007) . "A Summary of Densely Packed Decimal encoding". General Decimal Arithmetic. IBM. Retrieved 2016-01-02. This page was last edited on 28 January 2019, at 20:14 (UTC).